This used to be me. O.K., minus the downhill suit, but otherwise it's me. I didn't ski a downhill more than a few times and it scared the hell out of me. Slalom scared me enough. But there was a mystique about the racing scene. It lost something when the skiers switched to toy-sized skis. Am I revealing a prejudice? Am I old-fashioned? Anyway, this time of year, I do think about it. I remember being a ski racer. I remember being a coach of ski racers, which was less cool than plain freezing. So any opportunity I get to illustrate the sport is a treat. I wrote lengthy, fairly glamorous travel features for Skiing magazine for many years, and all of that seems like a different life now. 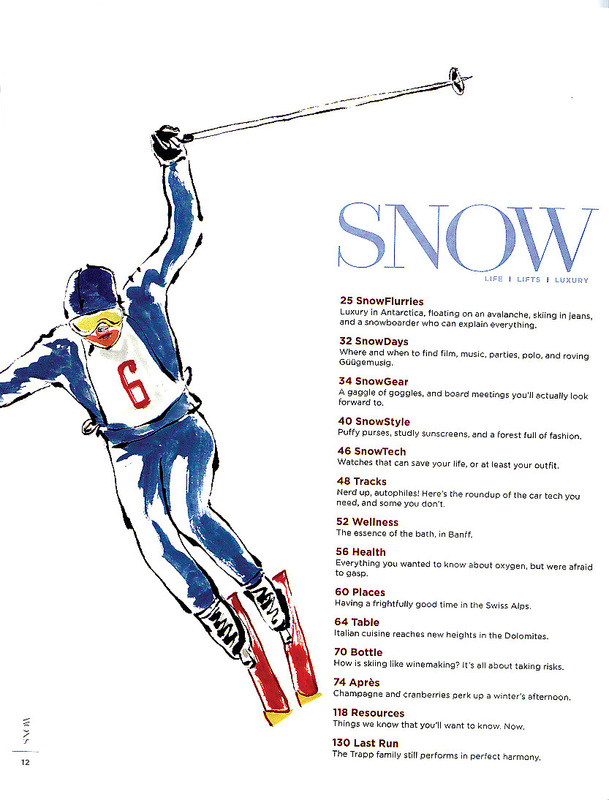 This illustration appeared in a recent issue of Snow magazine which also featured an article I wrote about ski fashion.